One of the key features of the Tellus Studio software toolkit is the ability to rapidly develop new applications to support our customer’s evolving requirements for visualization and data analysis. Components are reused at all levels of the software architecture while new components can be quickly developed and interfaced with the core framework to support the unique requirements of the application. 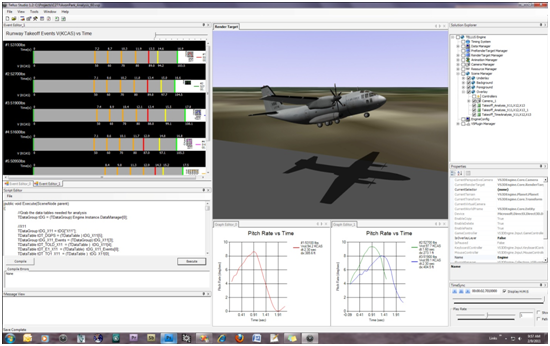 Recently, Tellus was used in support of the C-27J Joint Cargo Aircraft Program (JCA) safety confirmation flight test as a tactical takeoff performance analysis and visualization tool. The tool provided a range of visualization tools and data mining function to quickly ingest, store, and process unstructured flight test datasets. Query methods are also provided, through the Tellus database, for correlated selection of specific datasets. New fields can also be inserted into the database to generate derived datasets for use in the analysis process. For the C27J effort, data elements from each flight were computed and mapped using automated procedures relative to a normalized runway coordinate system. Calculated values from the C-27J Integrate Performance and Aircraft Configuration tool (IPAC) were also incorporated into the database for automated detection, comparison and analysis. Tellus’ integrated scripting engine was utilized to perform data integrity checks, mapping, range queries, and data table linking to the visualization tools. A completely new visualization component, the Runway Event Viewer, was developed specifically for runway takeoff performance analysis, visualization and comparison. 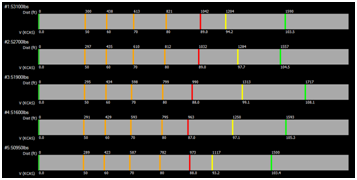 The event viewer provides a visual representation of time and distance domain values with corresponding event velocities relative to the start of the takeoff ground run. Important metadata associated with the event can be embedded into the event graph using standard windows tool tips. By hovering over the event, additional data will appear as defined in the database query script. Data was queried directly from the flight database and mapped to the event viewer to compare takeoff performance on a normalized scale. This was also linked with additional data channels for pitch attitude, pitch rate, vertical rate, weight on wheels (WOW) signal, and DGPS data. Flights were separated into takeoff roll and pitch maneuver phases to form an accumulated picture of events during the tactical takeoff maneuver. Each flight could be stacked to compare both takeoff ground run to the beginning of the pitch maneuver and concluded with the actual takeoff point. Data channels of interest can be directly linked to graphing tools to perform correlated analysis and normalization as needed. Metadata for the takeoff number/event number can also be passed along to the graphing tools for display and presentation formatting. The analysis results generated from Tellus were used to present an overview of the tactical takeoffs at the C-27J Performance Summit. Results included actual versus predicted performed and possible reasons for variations on takeoff performance and ground run distances.